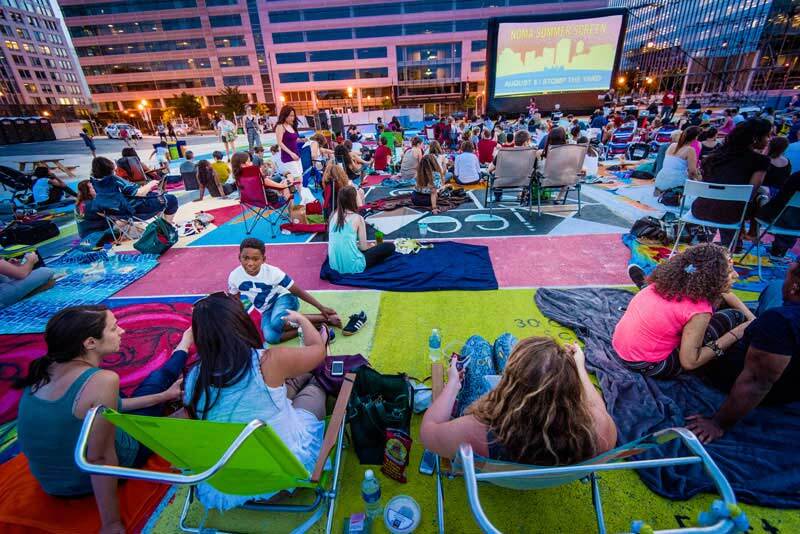 Check out the best places to experience the cinema outdoors in the nation’s capital. Summertime and movies go hand-in-hand. Yes, the biggest blockbusters are in theaters, but step your movie-going experience up a notch and relax outdoors while taking in a classic flick or one you’ve never seen before. 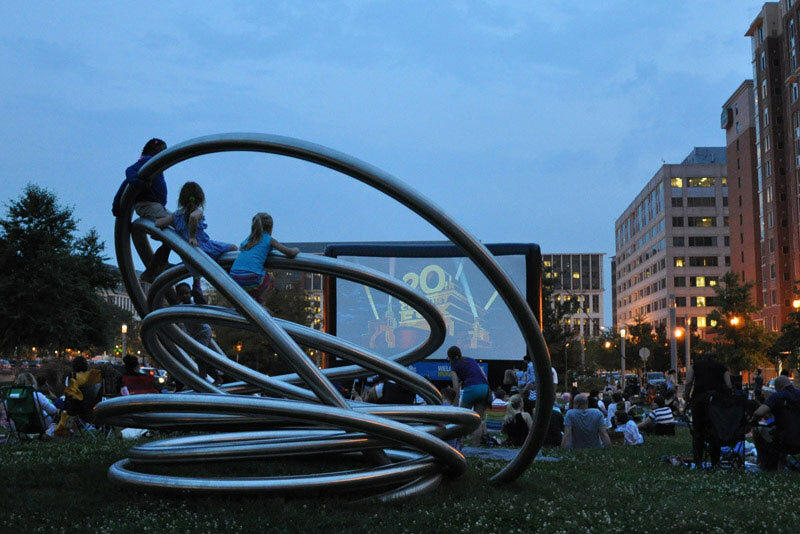 Many of these outdoor movie screenings in the District feature beautiful scenery and are free to attend. 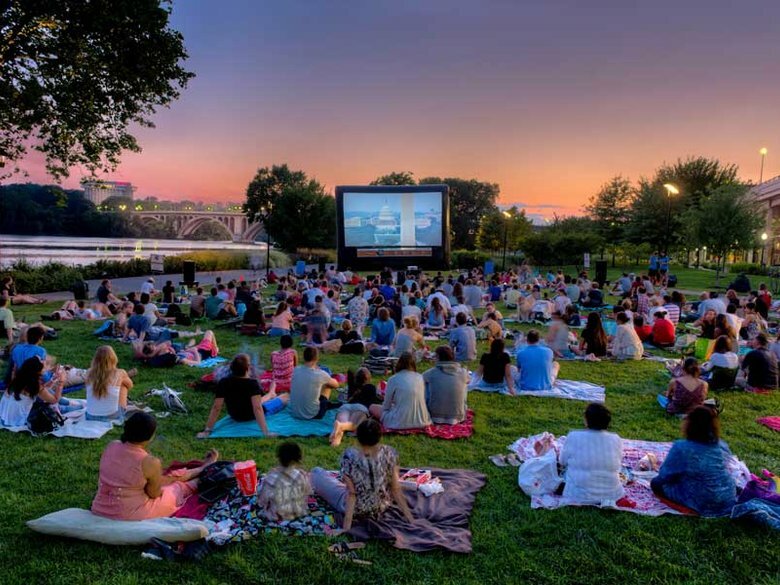 So head to the Georgetown waterfront, a drive-in screening at Union Market or plenty of other great places and turn summer nights into summer memories. Georgetown's Waterfront Park is one of the city’s most resplendent settings, situated right on the Potomac River. The neighborhood invites you to enjoy this year’s movie theme of “Movies That Rock,” as each Tuesday sunset screening highlights a story with a musical storyline. The lineup begins with Dirty Dancing on July 10 and concludes with Grease on Aug. 7. NoMa Summer Screen is an outdoor movie series that you do not want to miss. Numerous local food trucks are on-hand for the festivities in this happening neighborhood. This year, the series’ theme is Wonder Women, featuring films with strong female leads (Chicago, Rogue One: A Star Wars Story and, of course, Wonder Woman are among the screenings). Summer Screen is very popular, so get there at 7 p.m. when the doors open for the free screenings! This year, the fun takes place in a new location: The Lot at First & Pierce, at approximately 1150 First Street NE. The drive-in movie is not dead! Union Market, a DC hot spot that features artisanal wares and amazing food options, hosts this series of film screenings from the spring through the fall. Drive-in parking costs just $10 (reserve beforehand here), while ground seating is free for walk-ups. Upcoming films include Like Water for Chocolate (July 6), Black Panther (Aug. 3) and The Lion King (Sept. 7). Through Aug. 9, the gorgeous Canal Park in the Capitol Riverfront neighborhood invites families to take in a flick at sundown. You are invited to arrive as early as 7 p.m. so you can set up a picnic and prepare to be dazzled. The schedule is a mix of recent hits and classics, including Raiders of the Lost Ark (June 14), Despicable Me (June 21) and Black Panther (Aug. 2). 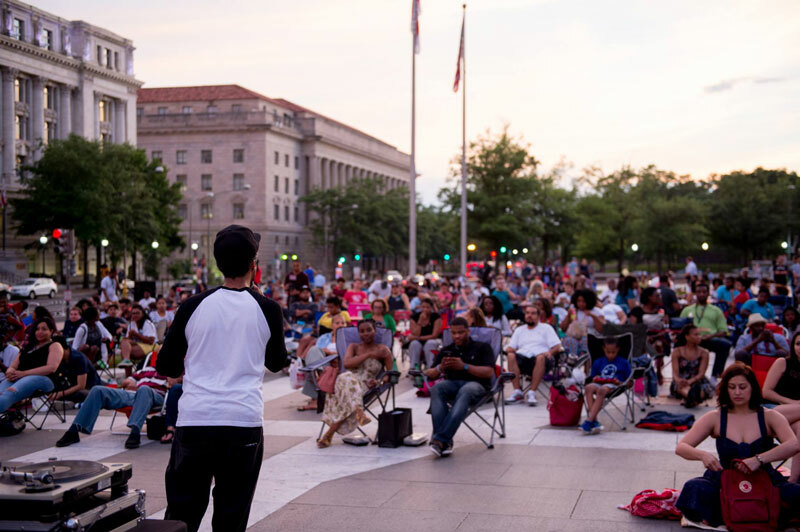 Head to Freedom Plaza at 13th Street and Pennsylvania Avenue for an awesome collaboration between the DowntownDC BID and SHAOLIN JAZZ. The Tuesday night screenings feature a classic martial arts film scored with an original soundtrack mixed live by DJ 2-Tone Jones. The events will also have martial arts demos, outdoor games and complimentary popcorn. Screenings begin at 8:30 p.m. Some highlights of the schedule: The Golden Child on June 19, Romeo Must Die on July 3 and Blood Sport on July 10. 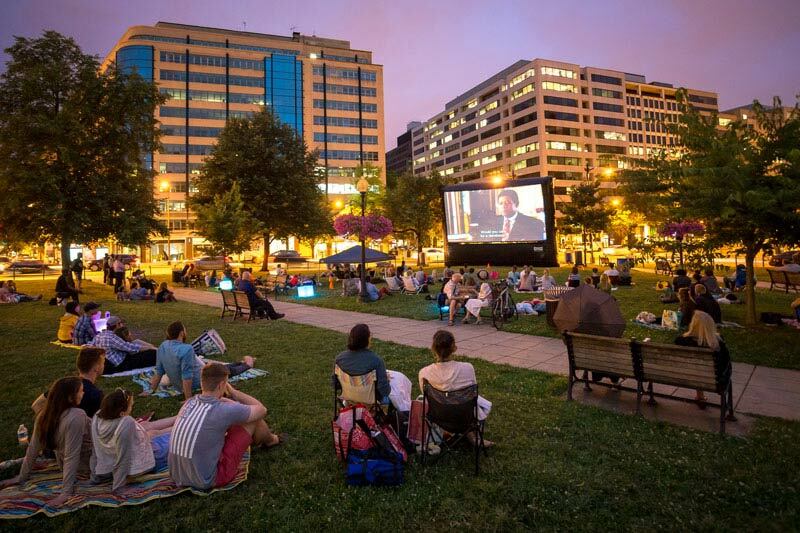 Every Friday evening through Aug. 3, post up in Farragut Park for a movie screening in the middle of one of DC’s most vibrant locales. June features Ferris Bueller's Day Off (6/15) and La La Land (6/22). In July, watch the sun set as you embrace classics (Back to the Future on 7/6, Casablanca on 7/27). Although you have to purchase tickets to this festival, your money will be very well-spent. Dumbarton House is a historic DC attraction in Georgetown, a great spot to bring the family to take in a movie under the stars (you can also become a member for free entry). Each film screened is based on a Jane Austen novel, so if you’re into Victorian romance, this is a summer must-do for you. Asian and Pacific Island culture are showcased in this series that takes place in Chinatown Park, a short walk from Capital One Arena in Chinatown. Popcorn and popsicles are provided at the free screenings, and guests are invited to bring chairs and blankets. On July 18, catch the Oscar-winning Life of Pi, and make sure you bring the kids to Kung Fu Panda 3 on Sept. 21. The expansive National Harbor is perfect for a family outing or a date night, especially when a film is being screened under a summer sky at its plaza. In fact, the Harbor hosts two nights of screenings each week of the season – one for couples (Thursdays, 7 p.m.), one for families (Sundays, 6 p.m.). Check out the packed schedule and pick out the free screening that works for you and yours. This four-day celebration of movies takes place in Maryland from Aug. 23-26. The scenic Strathmore Campus is a fantastic place to enjoy an evening outdoors, so bring along the crew to catch either Coco, Black Panther, The Lion King or Wonder Woman (or all four, since attending is free). Ridgewell’s will be on-site with food, too! Screenings begin at dusk, with festivities kicking off at 7:30 p.m. The festival benefits the National Institutes of Health Children’s Charities. 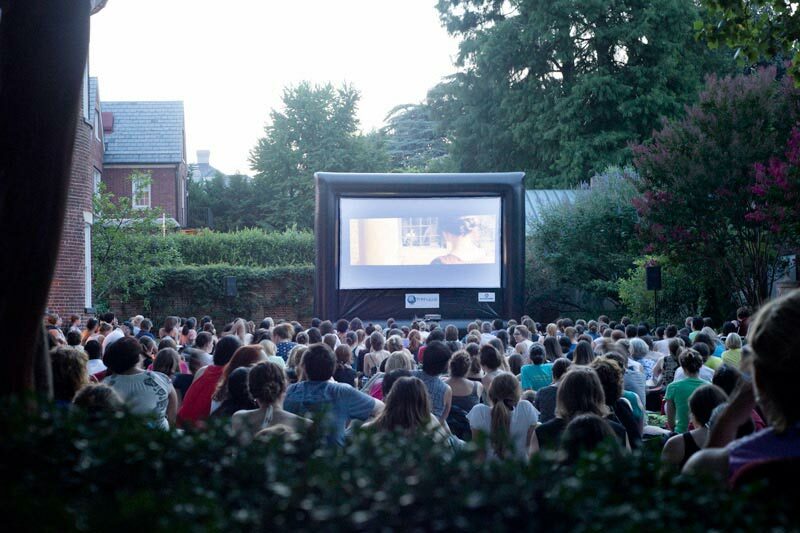 Considered one of Arlington’s best summer events, Rosslyn Cinema even features a Pub in the Park during these free Friday night screenings in Virginia, as well as food trucks. The lineup for the summer is a healthy mix of family-friendly (Ratatouille, Coco, The Lion King), comedy (Legally Blonde, Bridesmaids) and action (The Fifth Element, Argo, Lethal Weapon). Just a short drive or Metro ride from DC, this series has all the makings for a perfect summer night. The Martin Luther King, Jr. Memorial is one of DC’s most recognizable landmarks, and The Memorial Foundation is proud to present family-friendly, free-to-attend movie screenings this summer. On June 21, catch Marshall, which stars Chadwick Boseman, who also shines in the lead role in Black Panther, which plays on Aug. 23 to round out the series. Screenings begin at 8:15 p.m. If you’re looking to be spooked during a summer screening, this is absolutely the option for you. The Congressional Cemetery at 1801 E Street SE will show scary and suspenseful flicks once per month through September (a $10 donation is suggested). Although some comedy is sprinkled in for the first movie (Young Frankenstein on June 15), expect plenty of scares during Jurassic Park (July 20) and The Sixth Sense (Sept. 14).